Trying without success to get your baby to stop crying can be extremely stressful. However, your stress can actually make a fussy baby even worse. This makes you more stressed, and the cycle continues. How does your stress affect the baby? It’s well documented that stress during pregnancy can be passed on to your baby. Once your baby is out of the womb, stress is still easily passed between parent and child, because baby can sense how you are feeling. Because baby picks up on stress at all these levels, you must work to control and decrease your stress instead of just hiding it. 1. Take deep breaths. Focus on breathing deeply, in through your nose, out through your mouth. Try to mimic the rhythm of breathing while sleeping, especially if you are holding your baby. Baby can feel the rise and fall of your chest, and will automatically adjust her breathing to match your own. Try different sayings until you find something that really has meaning for you. Repeat it slowly in your mind to help you center yourself and insulate you from stress. 3. Visualize a relaxing place. Take yourself out of the current situation by visualizing a location that makes you feel relaxed. Many people think of lying on a beach, for example. Picture your location in exact detail; focus on what makes it “real” for you, such as the sounds, the smells, or the feeling of weather. 4. Remember you’re not alone. You are one of billions of parents who face a crying baby each day. The fact that baby won’t sleep isn’t a reflection on you as a parent and doesn’t mean that you are bad at parenting. It probably doesn’t mean that there is something wrong with baby, although if there has been a sudden change in behavior, visit your doctor as soon as possible. What it means is that baby hasn’t adjusted to life outside the womb yet. Baby doesn’t know how much sleep she needs and when she needs it. That lack of understanding is what causes nights like these. Remember, you’re not alone! 5. Take a break. It’s ok to step out of the room for a minute and collect your thoughts. If you stay in the same tense environment, it will be hard to change your mood, thus making it hard for baby to relax as well. Take a few minutes to yourself. Stretch your tired muscles, breathe deeply, and think logically. Then go back in and pass your newfound relaxation on to baby. The final step to staying calm is to know when you need to trade off with someone. 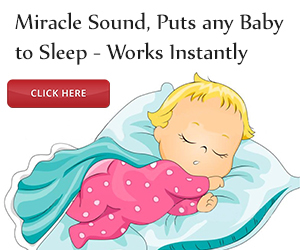 It can be a dangerous situation to be desperate for sleep with a baby that won’t calm down. If you find that you can’t bring your stress level under control, try to find someone who can switch off with you so you can leave the situation for a while. • You’re uncontrollably emotional: laughing, crying, etc. If there’s no one around who can give you a few minutes of rest, don’t despair. Engage in the stress management techniques listed here and keep going through this list of strategies. Combine them or try them alone until you find the solution for you. Remember that above all, your baby responds to your emotions; put yourself in a mental place where you feel relaxed and safe. Baby will sense this and adjust accordingly. 19 replies to "Baby Crying? Here Are 7 Ways To Stay Calm"
Thank you for this article. I have a newborn and know it is best to stay calm but sometimes find it hard to think of ways to maintain a calm composure. Working through this list should help me when I need it. Thanks again. Same here. I think my baby can feel when I’m under stress from my job. I will follow some of the good advice here. I had a really hard day today with my crying 6 week old boy. I drank 2 wines just to calm down. Now I know that is no way of coping, I know there’s a better way for me to cope. It is very hard at the moment, he’s going through a growth spurt and reflux. The more I’m upset, he’s upset. Vice versa. Hi, just read Sonya’s reply. I have a 2 month old son and i get really annoyed with him sometimes too just like your daughter. I have a partner than can help me sometimes but its still hard to listen to baby cry regardless of who is holding him. And what is causing me to stress out so much at the moment is that my son starts when he is tired but no matter what i do he wont sleep. The more i try to comfort and relax him the more he fights and crys. I’ve tried leaving him in his basket to get to sleep alone but he still just cries for hours. I really dont understand why he has to fight so much, why wont he go to sleep? Its nice of people to offer help but it doesn’t change my sons behaviour and im worried that people may think less of me or the baby when they get to know what he’s really like. Plus when i get so stressed with him and feel myself gettin angry it doesn’t just make him worse it makes me worse too. Because i know it doesn’t help and because i feel like i’ve failed for not being able to keep calm and just keep showing my baby love no matter how much he screams and kicks and throws his arms around. I keep getting bad tension headaches too, i do ask people to take over for a little while sometimes but cant help get upset for feeling like im ‘handing him over’. A few women have said to me at least there’s 2 of us as tho that makes raising a baby easy. It wouldn’t matter if there was just me or a house full of people taking care of my son, it doesn’t change how i feel. Its hard to get my son into a routine sometimes with having my partner around, because he believes doing things differently will help. Im going to try taking the advice from this site but just wanted to share my understanding of how frustrating it is. It would help also if there is any advice on how to stop thinking and feeling the way i do when my baby is having one of his bad days???? Crying helps the baby release emotions and if you left them have a good cry they will calm down. Pip, crying in the article you posted refers to adults. Crying is different for a baby. It is true that babies cry to release stress, but they also cry because they are in pain, lonely , need love and attention, and usually when they NEED something (food, change diaper, etc.) Babies cry because they can’t talk and it is how they communicate! Thank you for this article. I babysit toddlers and have a new 1 year old is throws screaming tantrums. I make sure she is fed, clean, has toys and is held. When I go to the kitchen to to the bathroom she screams bloody murder for an hour. It is against State regulations to have children in the kitchen if you run a day care, so Ithe other kids have to struggle with the constant screaming hysterics of the toddler. The toddler has two sets of grand parents plus aunts and uncles who live under the same roof. She is constantly held and coddled, but her there is just one person…me. I will try the suggestions in the article to keep me calm and happy. I love a cup of tea at regular intervals to help me relax. Monica, it’s probably a bit late for this and sorry you are feeling so down; I think it’s very likely you have PND and you should speak to your health visitor or gp urgently; I hope you did so ages ago though. Good luck. It gets easier. I am so happy I found this article, but also very happy to hear the comments. I am a mother of three and also have 6 two year daycare children here everyday. I cannot believe how much crying I hear in one day! I get so on edge and hate my job sometimes. When I try to talk to people about it, they make jokes or just ignore how stressed I am. I am looking for as many relaxation techniques as I can to help, because I really do love my job. I am so glad I read this article. I too have a 23 months old daughter whom I love dearest. She has been a gentle child since the beginning;eating, sleeping, playing was not much a problem with her. But recently she has started showing tantrums and what I’ve been noticing is that she does exactly what I did when I get angry. Sometimes I’ll get so angry that I’ll shout at her ,then later I’ll feel guilty and end up crying. I even thought I was incapable of being a mother and that I was alone. But this article has been an eye opener for me..so thank you.